A new luxury hotel opened its doors in January 2015 near the Champs-Elysées, La Réserve Paris Hotel and Spa. 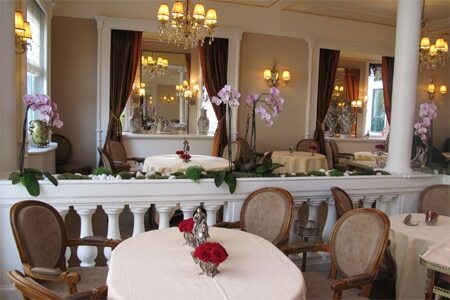 Decorated by Jacques Garcia, it includes 28 suites, a spa and a gastronomic restaurant, Le Gabriel. Former chef of Senderens, Jérôme Banctel oversees the kitchen. For dinner, expect dishes like foie gras with green apple and yuzu jelly, braised calf sweetbread with ricotta-stuffed raviolis, and chocolate soufflé with saffron and cocoa sherbet. Lunch menu at €58 and dinner menu at €115. Lunch & Dinner daily. Le Gabriel, La Réserve Paris Hotel and Spa 42, av. Gabriel, 75008 Paris, 01 58 36 60 50. Chef of L'Ambroisie with his father Bernard, Mathieu Pacaud has recently opened Hexagone, a posh restaurant near the Champs-Elysées. The place features a bar, a 70-seat dining room and, to be open shortly, a “culinary research cabinet.” Pacaud crafts traditional cuisine with a touch of sophistication. There’s a well-stocked wine cellar with 1,200 labels. Lunch & Dinner Tues.-Sat. Hexagone, 85, av. Kléber, 75016 Paris, 01 42 25 98 85. 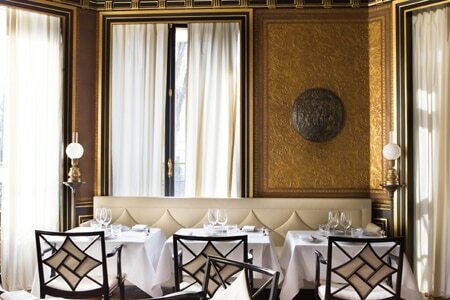 Following the departure of Adrien Trouilloud to Restaurant Lasserre, a new chef helms the kitchen of Rech, the Parisian seafood restaurant of Alain Ducasse. His name is Damien Leroux, previously of Rivea in London. Rech, 62, av. des Ternes, Paris 75017, 01 45 72 29 47. After a two-year stint at Rech, the 27-year-old Adrien Trouilloud has become the new chef of Restaurant Lasserre. The menu features old favorites like the foie gras-stuffed macaroni and the orange duck as well as new dishes such as the lettuce cream with scallops and caviar. Lunch menu at €90 and dinner menu at €220. Restaurant Lasserre, 17, av. Franklin D. Roosevelt, Paris 75008, 01 43 59 02 13.